Jakarta (VNA) - Indonesia is enhancing measures to terminate forest fires across the archipelagic nation as the number of hotspots rise significantly. A total of 21 helicopters and 212 Cassa planes have been deployed to conduct water bombings and creating artificial rains, spokesman of national disaster management agency Sutopo Purwo Nugroho said on August 22. A satellite image showed that a total of 538 hotspots from west to east of the country with most of them detected in Borneo Island in the central parts and eastern Papua province, the spokesman said, adding that the number of hotspots will rise at the end of August and September. Soldiers, policemen and personnel from disaster management agency as well as volunteers have been taking part in the battle against the fires, he stressed. 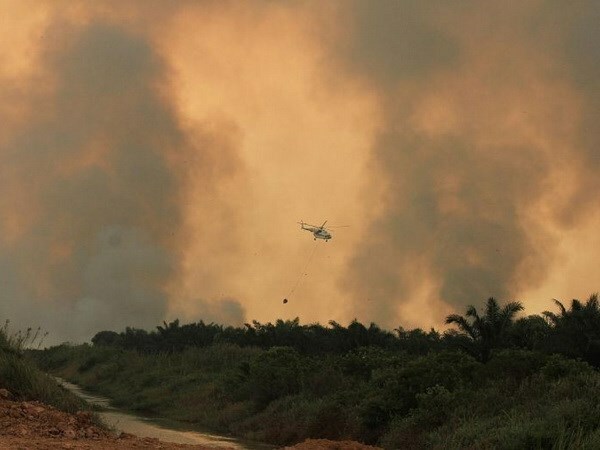 Six provinces situated in Sumatra Island and Borneo Island have declared emergency condition over the fires, Sutopo revealed. Lack of water and difficulties in reaching the affected areas are among the major challenges to douse the fires, he said. However, the size of forest fire-affected areas has declined to about 20,000 hectares at present, from 438,000 hectares and 2.61 million hectares respectively in 2016 and 2017, the official said. The spokesman warned people to stay alert over a greater potential of expansion of fires next month.